The exquisite Delaire Graff Estate begs a visit for the views alone. As it's located near the top of Helshoogte Pass in Stellenbosch, the property overlooks dramatic mountainscapes, sweeping vineyards or the Stellenbosch Valley, depending on which direction you face. 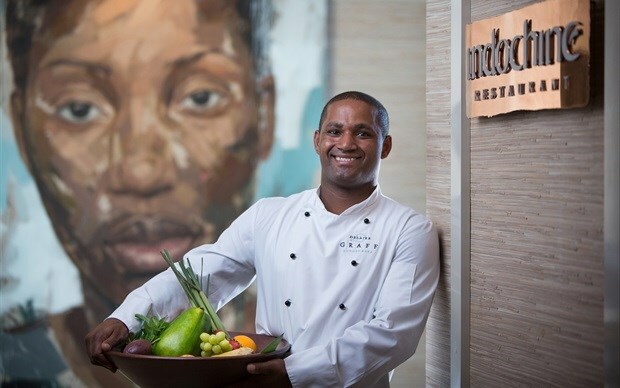 But sample some of Delaire’s award-winning wines or sit down for a culinary treat at one of the estate’s two flagship restaurants, and you’ll soon awaken some of your other senses. One of these restaurants is Indochine, an Asian-inspired fine dining food theatre and a regular Top 30 nominee in the annual Eat Out Awards. Guiding the talented team of chefs at Indochine is spirited head chef Virgil Kahn, who recently returned home from a three-week trip that saw him working and dining his way through Southeast Asia. Sampling fare from humble street food stalls to world-renowned restaurants, Kahn found their shared passion for quality, fresh ingredients equally inspirational. His journey began and ended at two fellow Relais & Châteaux properties. 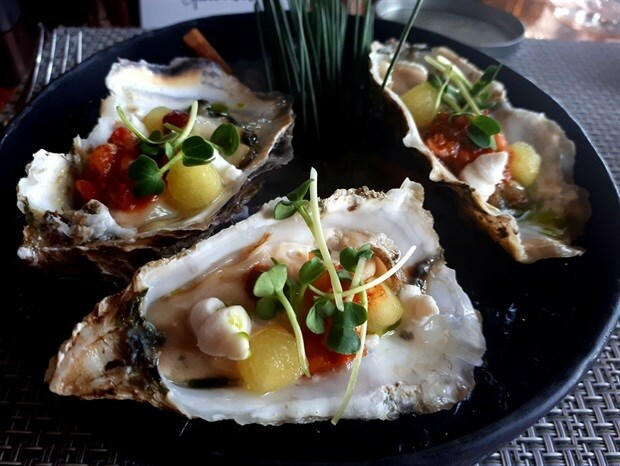 Wanakarn, a beach resort and spa situated north of Phuket, offered authentic Thai cuisine while Saint Pierre, a one Michelin star restaurant in Singapore, featured contemporary French fine dining with an Asian flare. The chef also had the privilege of tasting his way through the 25-course ‘emoji’ menu at world-renowned Gaggan in Bangkok, a restaurant that has held the top spot on Asia’s 50 Best Restaurants list for four consecutive years. Kahn is sharing his experience with us back home the best way he knows how – with a new, inspired menu at Indochine. And I, along with fellow members of the media, scored the chance to experience the new offering. Arriving at Indochine, you’re faced with the choice of dining inside or on the terrace overlooking Table Mountain. The former is where we placed ourselves - a striking setting with hues of deep blue and copper, with an art installation comprising over 1,000 swallows swirling above. The waitrons arrived with some canapes: a punchy shrimp paste with crackers, fresh Korean oysters with fermented kimchi, and the very innovative pine needle smoked langoustines on scorched tofu. We’d barely begun, and I was already impressed. 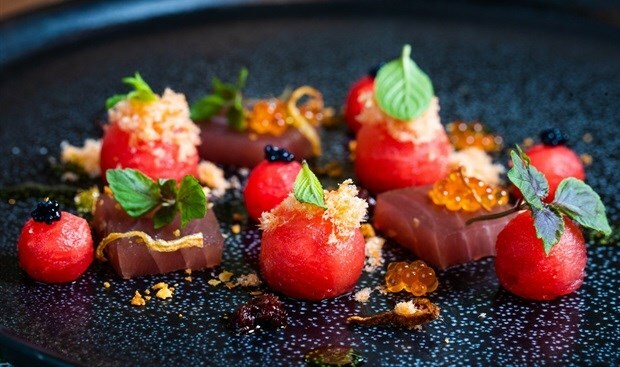 Our starter, inspired by Thai cuisine, was slices of fresh tuna with sweet watermelon, salmon ginger floss, salmon roe, and Thai herbs – a well-balanced ensemble of refreshing summer flavours. Not to mention wonderful to look at. 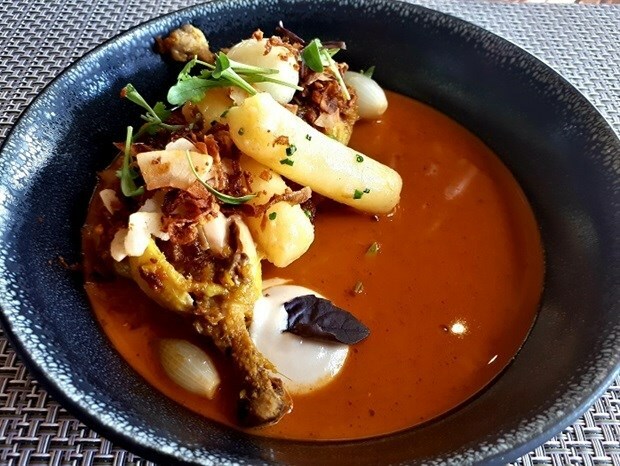 For our main course we were served Massaman Curry with wood-fried baby chicken, burnt onion, confit potatoes, toasted coconut and Thai herbs. Inspired by Thailand, but influenced as well by Malay and Indian cuisine, we were all blown away by the depth of flavour this dish delivered. Creamy, spicy and moreish, Kahn knocked it out of the park with this curry. 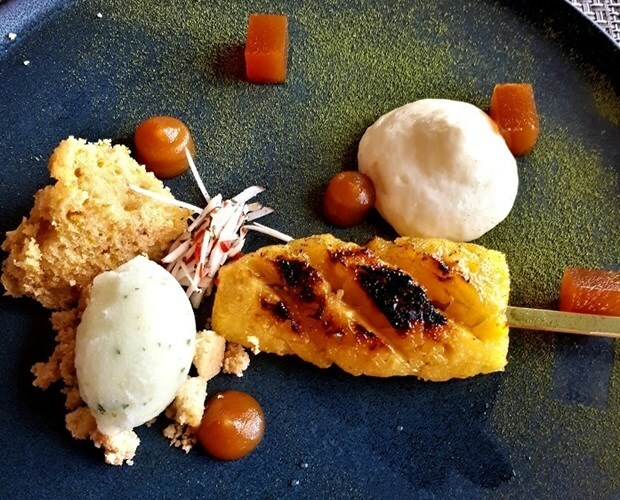 To end the lunch, our Singapore-inspired dessert arrived in the form of grilled pineapple, mojito sorbet, Malibu, coconut lime cake and pineapple jellies. As I’m not much of a sweet tooth, the slight sourness of the pineapple combined with the sorbet made for a refreshing ending to a day of culinary delights. For Indochine’s new menu, Kahn has selected highlights from his Southeast Asian adventure and added a South African twist, using fresh herbs, micro greens and vegetables from Delaire’s very own greenhouse. 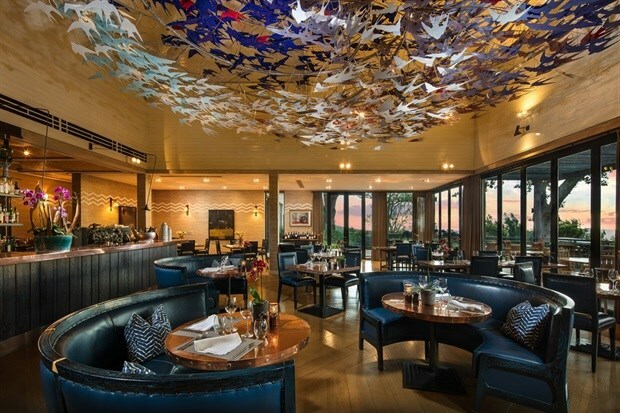 While Asian fusion eateries are dime a dozen in South Africa, Kahn’s flair for creating unique flavour combinations and plating them as works of art make Indochine a clear standout. For more information on Indochine, visit the Delaire Graff website and connect with the estate on Facebook, Twitter and Instagram.